Hey guys, just to let you know I'm going to be taking a break for a bit. I'll probably log on just to check waiting list and to chat a bit, but no grinding. Shaiya is getting a bit ridiculous. We'll see how this goes. I will be selecting my first one or two officer(s) on Wednesday, with some help and advice from others. If you're interested, fill out an application. 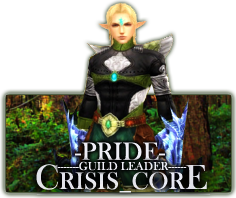 Pride, on your post about the guild quests on the Shaiya forums, they said that the GM's are talking to SonoV to put the guild quest times on the weekend so the guys just said to be patient. As for Guild Wars, it's just a lot of planning and strategy in the beginning. I can give you a few tips if you want to start off. The thing is though that for PvP, the metagame keeps changing so you can never just stick to one strategy if you want to be the best. Seriously a hiatus is good every now and then. It sounds like you've overplayed and are burnt out on this. Ok pridey, to much shaiya can be bad for your health, because the internet has been shown to be 1000% percent effective at giving you syphillis. salmoneus wrote: Ok pridey, to much shaiya can be bad for your health, because the internet has been shown to be 1000% percent effective at giving you syphillis. So THATS what that is!!! Well, if you're still looking for something to take a break with, try Mabinogi. Very different style, and if you arn't a paying player, you're pretty much done after two weeks or so (lvl 35-40). Its a great game in theory, but it really shouldn't be classified as a free game, more of a paying game that gives a free trial. Great community of players though. IF Mabi isn't your style, you might want to try Secret of the Solstice. It isnt bad, but it is pure grind. I played it for a while, but it was in OB then (still might be) and frankly the high lvl areas were too overcrowded to be any fun. Kinda wish I hadnt given my nice gear away (dread equivilent armors, and legend equiv staff), might've been amusing to dl it again and see how much the game's improved (max realistic lvl was 80ish then, 3rd and 4th class changes wern't even implemented). It wasn't a bad game, but it had a lot less depth then Shaiya. Very gear based too. *psst Try Neverwinter Nights* XP Jkjk.